As director of marketing for Brisnet.com, one of the parts of my job I most enjoy is getting the Ultimate Past Performances in the hands of more people. Partnerships with Hello Race Fans and HorsePlayerNOW have helped spread the word (and the data), but with new blood comes questions, including the most basic of all: "How do I read this stuff?!!" The basic race chart and past performance line that comes from it is a lot like a baseball box score in that the information and how it's presented hasn't changed much over more than a century of competition. But just as Sabermetrics and the Elias Sports Bureau changed how we process that information as well as the information we want with it, so, too, has racing evolved with the advent of proprietary data ranging from "simple" speed ratings to complex indices to compare performance. The information available is not the only thing to expand, however, as access to that information is easier than ever as well. The aforementioned Ultimate PPs includes dozens of data points that even a generation ago would have required several sources and hours of research to track down. When people ask, "How do I read this stuff" they actually mean, "How do I determine what's important?" Like so many questions in racing, the answer is, "It depends." And for me when handicapping what "it" most often "depends" on is PRICE, which is why my favorite line in Len Ragozin's book The Odds Must Be Crazy is "at 30-to-1 I love the line [the horse's form or pattern]; at 3-to-1 I hate it." I was reminded of it again (and in a good way) on Sunday, July 7, when Midnight Aria won the Queen's Plate Stakes at Woodbine gate to wire at 16.6-to-1. There was enough not to like about Midnight Aria (distance questions and speed ratings tops on the list) that there's no way I'd have backed this horse as one of the favorites, but the one thing to like (lone speed) made him extremely attractive at the price. 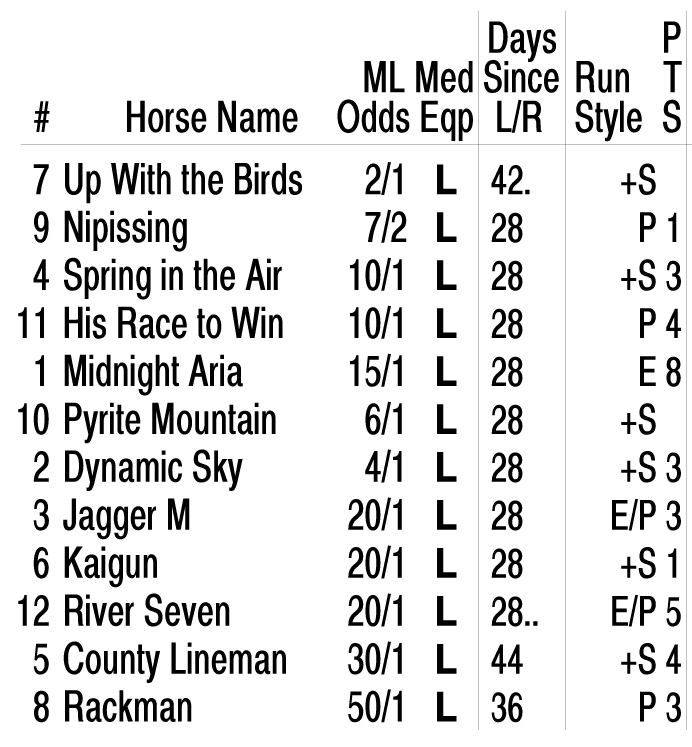 Now admittedly you don't need Brisnet.com Ultimate PPs to figure out if there's a lone speed type in the race. A bunch of 1s on the left-hand side of the running lines on one horse but not on any others is the best indication, but that still doesn't tell the whole story. That's where the features of more designer PPs such as Brisnet.com's Ultimate PPs can come into play. Not only was Midnight Aria an easy-to-identify frontrunner but also his designation as "E8" heightened the gate-to-wire threat. 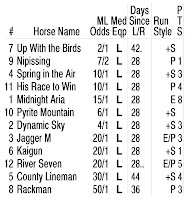 It's not uncommon to find a race with only one "E" or one "8" type, but it is rare that the only "E" is an 8 with the next closest pursuer an E/P 5. Again, at 3-to-1 I hate the line, but at 16.6-to-1 I was willing to take a chance. Sometimes handicapping a race requires putting all the pieces together like a puzzle to see the big picture, but other times there's such an imbalance between the potential success of a piece of data and the price a horse is offering that that is all you need to know. Another good day to learn how to write a 5 paragraph essay https://nerdymates.com/blog/five-paragraph-essay!